Simon with his Certificate of Freedom after the ceremony. Simon Rainer has received the Freedom of the Goldsmith’s Company at a ceremony held at Goldsmith’s Hall on April 5th. The Goldsmiths’ Company is one of the Twelve Great Livery Companies of the City of London originating from the trade guilds of the Middle Ages and is an institution that is more than 700 years old. Nowadays the company promotes excellence in design and craftsmanship and has the responsibility of hallmarking all precious metal jewellery made in the UK. After the ceremony, Simon was then escorted by wardens from the Goldsmith Company to the Guildhall, where he was invited to apply for the Freedom of the City of London. 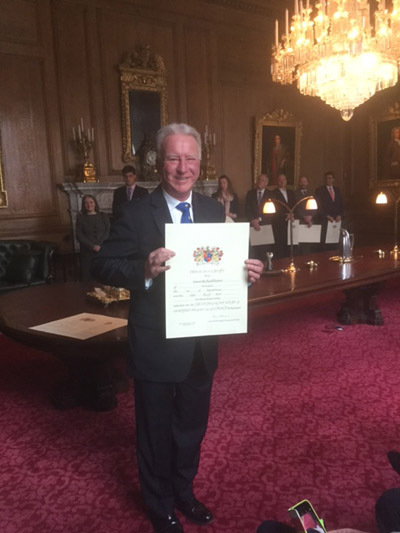 “I was absolutely delighted to receive the Freedom of the Goldsmith’s Company and it was a proud moment to be recognised for my contribution to the UK and International jewellery markets over the last 25 years” said Simon. Now running his own jewellery consultancy business, Simon was most recently CEO of the British Jewellers’ Association. During his time at the BJA, he was a Director of the Responsible Jewellery Council, led two commissions for the World Jewellery Confederation (CIBJO), was one of the founding partners in the UK Jewellery Ethics Committee, and worked extensively with the Foreign and Commonwealth Office for reform to the Kimberley Process. His work as industry ambassador for greater transparency in the jewellery supply chain and championing the many benefits of Corporate Social Responsibility also saw him involved with Universities, Civil Society and Fairtrade Gold. Recognition of his work in the jewellery industry also saw him receive the prestigious UKJA ‘Outstanding Contribution to the Industry’” award.